Model tests with the Heidrun tension-leg platform found that large irregular waves created oscillations which had a big impact on total tension in the tethers. The effect is termed “ringing”. 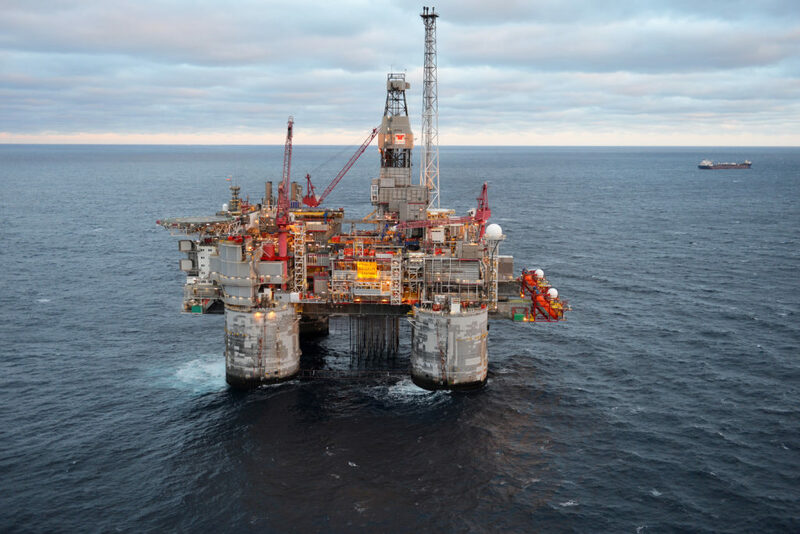 Uncertainty over whether this would also occur on the Draugen platform prompted hectic activity at both operator Shell and Norwegian Contractors, builder of the concrete gravity base structure (GBS). Put simply, the ringing effect described oscillations which arose in the tethers mooring Heidrun’s floating concrete support unit to the seabed when it was subject to large and uneven wave forces. In the Draugen case, the concern was that a similar phenomenon might cause deflections in the single topside support shaft which increased loads on the concrete and reinforcement. 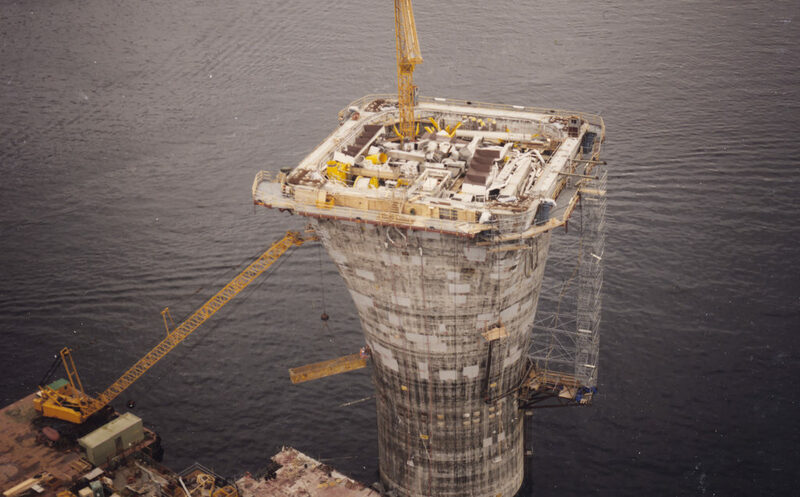 Slipforming of the Draugen monotower was actually halted while model trials were conducted to assess how important the ringing phenomenon might be. A rather more comprehensive and technical explanation is that this represents a non-linear effect which arises when steep waves strike the vertical surfaces on a structure. This is a short-lived reaction which particularly affects the splash zone – the area alternately above and below water as waves rise and fall. The effect gets its name because the oscillations created are similar to those experienced when a church bell is set in motion. [REMOVE]Fotnote: Intervju med Eivind Wolff, NCs prosjektdirektør for Draugen-prosjektet. Av Finn Harald Sandberg, Norsk Oljemuseum. Since the hydrodynamic mechanism which causes ringing is still not fully understood, model trials continue to be recommended to determine the relevant load. Such tests were initiated for the Draugen platform at a specialist lab in Denmark as a result of the Heidrun experience. Calculations also sought to simulate what might happen with the Draugen structure under the relevant conditions. The platform’s slim support shaft is topped by a transition piece which converts a circular cross-section into a square shape. That places four big vertical surfaces above the sea surface and immediately beneath the topsides. Model testing showed that when a particularly high (100-year) wave hit such a surface, the shaft experienced an extra loading which transmitted extreme forces – up to 70 per cent greater than those previously calculated – down its structure. [REMOVE]Fotnote: Intervju med Eivind Wolff, NCs prosjektdirektør for Draugen-prosjektet. Av Finn Harald Sandberg, Norsk Oljemuseum. The immediate problem on Draugen was overcome by extending the circular section of the shaft a further four metres, so that the big surfaces were less exposed to high seas. 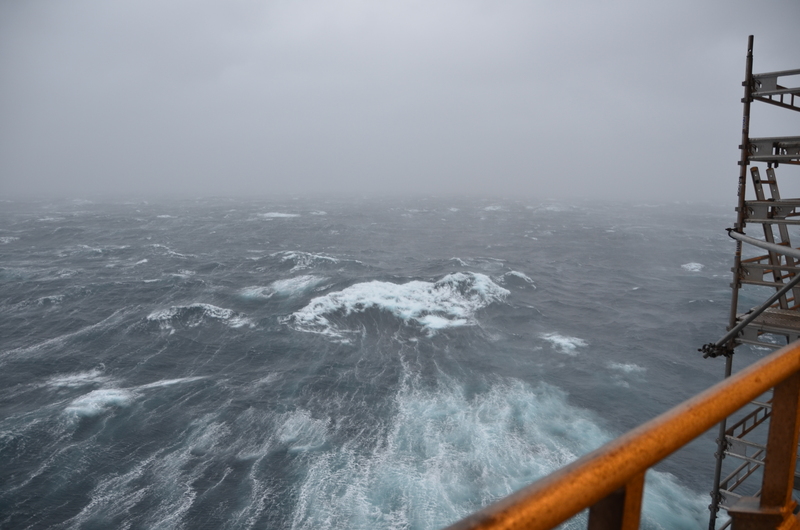 That also helped to resolve the problem of waves hitting the base of the topsides. It transpired that the predicted impact was smaller than had been feared after the initial model tests on Heidrun. Two reasons accounted for this. Ringing reduces with larger dimensions. A model will accordingly show a much bigger effect than a full-scale structure. This primarily reflects the impossibility of simulating the real speed of shock waves in model trials. The effect on a cylindrical or conical tower will also be smaller because the waves strike a smaller surface (decrease with reduced diameters) than with the rectangular areas found in parts of the Heidrun support structure. In addition, Heidrun’s four tethers produce bigger oscillations than the single shaft used on Draugen. [REMOVE]Fotnote: Intervju med Torvald Sande. Abv Finn Harald Sandberg, Norsk Oljemuseum. Slipforming the concrete monotower for the Draugen GBS had been halted for three months in anticipation of these results, but this structure was not on the critical path anyway. A bigger problem was presented by the cost of the required changes. Not only were more steel and concrete needed, but the internal outfitting of the shaft was affected by the added height. Ringing is described as a transient response – in other words, it increases very rapidly and then declines rather more slowly depending on how the oscillations damp down. The oscillations are caused by a powerful load impulse, which acts like slamming (the same effect as a hard punch). But this is not the same as the effect caused in air by shock waves (such as aircraft breaking the sound barrier). It is manifested primarily by extreme values – like 100-year waves – although these also contribute to fatigue. Ringing is not significant for fatigue since powerful episode are infrequent. Næss, A. & Moan, T. (2013) Stochastic Dynamics of Marine Structures. Kumar, A. & Kim, C. H. (2002). Ringing of Heidrun TLP in High and Steep Random Wave. International Journal of Offshore and Polar Engineering vol 12, no 3. Fames, K. (1996). Computer Efficient Ringing Analysis of the Heidrun TLP. Paper presentert på Sixth International Offshore and Polar Engineering Conference, 26-31 May. Los Angeles, California, USA. Combining good and pleasant accommodation with safe and effective access to work areas was a key requirement in designing the living quarters for the Draugen production platform. Bernt Bekke landed this job in 1988. The Draugen platform’s topsides – the part which rests on the concrete gravity base structure (GBS) – is based on an integrated design. That gives a compact solution with no use of modules.